The Ariens Deluxe 28 254cc Two-Stage Snow Blower is a large 28 inch wide machine with almost all of the bells and whistles that many consumers look for. About the only features that this snowblower does not have are the padded handles and the heated handle option. Other features that consumers will find useful is the remote chute control that allows you to adjust the direction of the chute on the go. It also comes with auto turn so there is no need to try to manhandle the machine. With a 28 inch width, it will make short work of clearing snow from wide longer driveways, side walks or small parking lots. The serrated edge auger will cut through heavy snow and ice with ease according to the manufacturer. If anyone has used this machine feel free to comment and let us know how well it worked for you, what you liked and did not like. The Ariens Deluxe 28 254cc Two-Stage Snow Blower comes with 6 forward and 2 reverse speeds, powered chute control, steering control with auto adjustment, LED light, and electric starter. 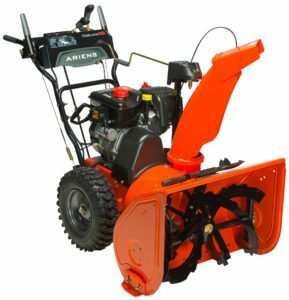 There were no customer reviews available for the Ariens Deluxe 28 254cc Two-Stage Snow Blower at the time of preparing this review.